ECHO is proud to be an equal opportunity employer who fosters an environment that embraces diversity. We are committed to assembling a diverse and well trained group of volunteers and interns. All qualified applicants will receive consideration without regard to race, color, religion, gender, gender identity or expression, sexual orientation, national origin, genetics, disability, age, or veteran status. Interns play an important role at ECHO. 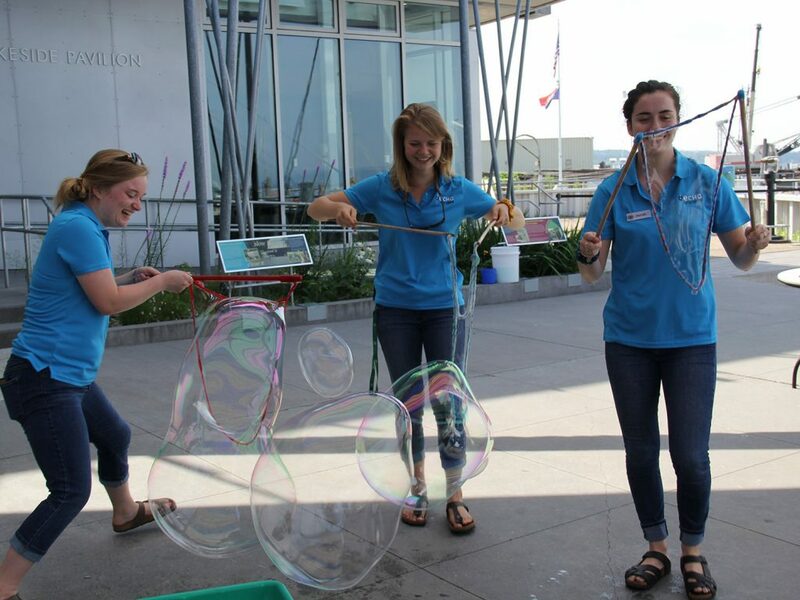 They bring experience, leadership skills, and enthusiasm to support our mission to engage families in the joy of scientific discovery, the wonder of nature, and care of Lake Champlain. ECHO provides a variety of internships throughout the academic year and during the summer. Please see individual position descriptions for more information. While at ECHO, interns gain hands-on experience to build relevant job skills, craft a competitive resume, and further their individual and/or career goals. Interns receive training in their area of focus, work closely with a staff mentor and work both independently and collaboratively on projects in support of ECHO’s mission. Interview: If you meet the qualifications for the internship position, you will be contacted to for an interview by the internship supervisor. Orientation and training: Orientations are held winter, summer and fall. When you have been selected as an intern, your supervisor will coordinate orientation, training. Description: This internship is specifically for students who wish to earn academic credit from their college/institution for their time at ECHO. 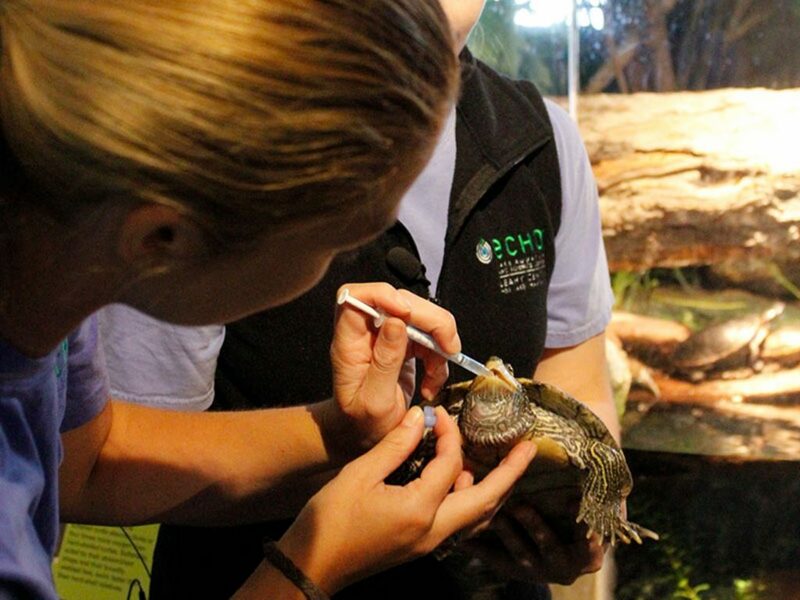 Animal Care Academic Interns assist and support staff in a professional, state of the art animal care environment, as is provided in Association of Zoo and Aquarium accredited institutions throughout the US, for native fish and reptiles, as well as native and exotic amphibians. After initial hands-on training, Interns will be required to accomplish husbandry tasks independently and must complete assigned individual project work. Responsibilities include but not limited to: feeding animals, cleaning animal enclosures, medicating animals, creating and installing naturalistic habitats, animal handling, animal collecting, record keeping, researching natural history and captive husbandry. Animal Care Academic Interns arrange for internship credit with their college/institution. Any requirements (paperwork, contracts) must be presented before start of internship to ensure Intern and ECHO staff can and will meet all requirements. Qualifications: Three months prior experience as volunteer or intern in professional animal care facility. Applicants should be enthusiastic, detail-oriented, reliable, and willing to get wet and/or dirty! Occasional heavy lifting (up to 60 pounds) may be required. Majors in animal science, wildlife biology, pre-vet, aquaculture, environmental science, or related fields preferred. Desire to continue learning about the sustainability challenges facing the Lake Champlain Basin and the way individual actions can affect change. Time Commitment: Internships require a full semester or summer commitment. Fall (September-December) Spring (January-April) Summer (May-August). 16 week commitment with a minimum of 12-15 hours a week. Description: ECHO’s mission is to inspire and engage families in the joy of scientific discovery, the wonder of nature, and the care of Lake Champlain. ECHO is a dynamic learning and teaching community committed to engaging diverse public audiences in dialogue; providing experiential, relevant and lifelong educational experiences to guests; and inspiring environmental stewardship of the Lake Champlain Basin. ECHO interns are expected to contribute to a productive, respectful workplace by modeling good humor, communication, collaboration and accountability to our colleagues, community partners, animals and guests. Time Commitment: August 25, 2018 – December 10, 2018. Expected time commitment of 10-15 hours per week. Most work occurs within regular business hours, occasional evening and weekend shifts may be required. Academic Credit: You must arrange credit through your university or college. Students should contact their Career Services Offices. Description: ECHO’s communications & design intern will help tell the story of this innovative science and nature center dedicated to inspiring and engaging families in the joy of scientific discovery, wonder of nature, and care of Lake Champlain. The design and communications intern role allows students to practice their creative skills in real-world applications and grow their portfolio. Description: ECHO’s Development Internship offers a challenging and highly rewarding experience for anyone considering a career in communications, fundraising or non-profit management. Interns work with ECHO’s development staff to broaden community understanding of ECHO’s charitable mission, particularly via non-traditional and multi-media platforms; evaluate and build understanding of ECHO’s Open Door community access program; and provide outreach support to ECHO’s donor and member constituents. Assist with creating outreach material to existing donors/members. Support mission marketing and fundraising efforts via direct mail and e-mail. Work with Open Door program partners to increase availability to underserved communities. Assist with the planning and execution of recognition and fundraising events. Support community outreach efforts including in-kind giving program. Support departmental record keeping and database management. Time commitment: Internships are a semester commitment: Fall (September-December), Spring (January-April) or Summer (May-August). Fifteen week commitment with a minimum of 12-15 hours a week. You must be available to work occasional weekend and/or evening shifts. Description: This internship provides undergraduate and graduate students opportunity to gain practical experience with formal and informal teaching opportunities with young visitors ages 0-6 and their caregivers. ECHO’s Early Childhood Education Internship offers a challenging and highly rewarding experience for anyone considering a career in early education. ECHO is a fast paced environment which requires both team and independent work; the ability to work with visitors of various backgrounds and ages, and an interest in the Ecology, Culture, History, and Opportunity for stewardship in the Basin. ECHO Leahy Center for Lake Champlain is Vermont’s innovative science and nature center. Located on the Burlington waterfront, ECHO features 70 live species, diverse interactive experiences, hands-on STEM activities, changing and permanent exhibits, and seasonal events and festivals. ECHO’s summer education internship offers a challenging and highly rewarding experience for anyone considering a career in informal science education. We provide undergraduate and graduate students opportunity to gain practical experience with informal teaching opportunities with visitors of all ages. 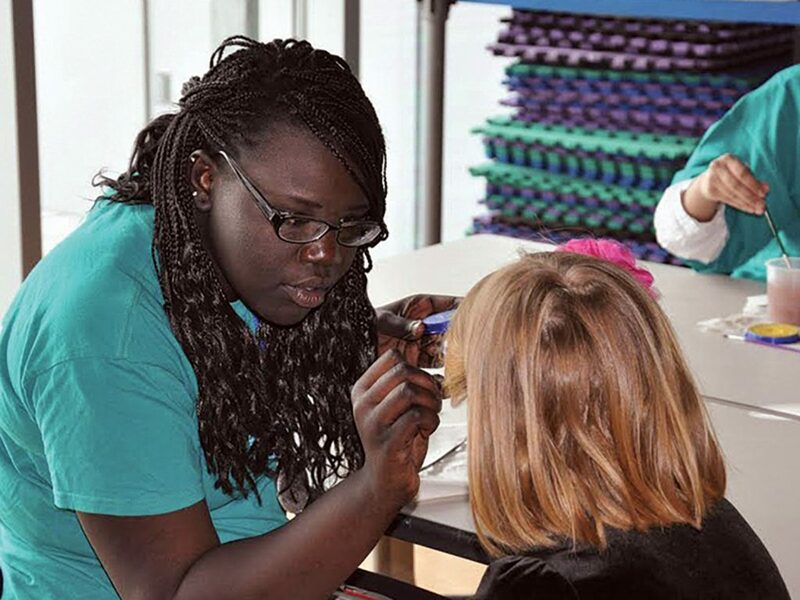 ECHO’s educational activities are diverse, ranging from the biology of Lake Champlain species to exploring chemistry concepts through hands-on experiments. This is a fast paced environment which requires both team and independent work, a high level of self-motivation, the ability to work with visitors of various backgrounds and ages, and a passion for our mission. Description: Guest Service/Event Interns will assist at our front desk, in our gift shop and help with some events at ECHO. Interns will get a complete understanding of our front of the house operations including daily admission sales, gift shop sales and merchandise, group check in and event management. Interns will be able to develop customer service and hospitality skills, work with point of sale computer programs, and assist with event execution. Qualifications: We are seeking a person with good written and verbal communications skills, a customer service background, a pleasant telephone manner, a bubbly personality and a flexible schedule. Computer skills including proficiency with Microsoft Office and familiarity with using database applications are desired. Hours vary and some evening work is necessary. Some heavy lifting may be required. Interns seeking careers in hospitality, customer service, or non-profit-specific positions will find the most direct benefit from this Internship. Time Commitment: Internships are a semester commitment. Fall (September-December) Spring (January-April) Summer (May-August) Fifteen week commitment with a minimum of 15-20 hours a week. Must be able to work weekends and some evenings. Description: Assist the IT Systems Manager in providing support to Staff and Volunteers, maintaining servers, wired and wireless networking hardware, and VoIP PBX phone system. ECHO’s IT infrastructure is a unique blend of a typical small corporate network, retail environment, and unique technology based exhibits. You’ll work with IBM and Cisco equipment, VMWare ESXi virtualization, and a mix of Windows and GNU/Linux network operating systems. Projects may involve documenting existing infrastructure, researching, planning, and deploying new technologies, and auditing network policies. This is an exciting opportunity to gain practical experience in many diverse areas of Information Technology, with an institution making a significant difference in the quality of life in the Lake Champlain Basin and beyond. Qualifications: This internship is recommended for students in Computer Networking or Computer Science majors, particularly those with a strong focus on Systems Administration. Ideal candidates will have classroom or work experience with Windows and Linux server system administration, including Active Directory and GPO configuration and comfort working in a CLI Linux server environment. Experience in VMWare ESXi environments, scripting (Bash & Powershell), Cisco enterprise routers and switches, and computer hardware a plus. We are looking for students who are responsible, detail-oriented, and able to work independently and as part of a team. Ideal candidates will have good communication skills and the ability to explain technology to non-technical staff. Time Commitment: Internships are a semester commitment. Fifteen week commitment with a minimum of 14-16 hours a week. The ideal candidate for this internship would be available for both fall and spring semesters. Time Commitment: 12 Week, 32 hours/week paid internship from Mid May – Mid August. Typical schedule consists of 4 days a week, 8 hours a day. Description: ECHO, Leahy Center for Lake Champlain is located on Vermont’s Burlington Waterfront. ECHO features 70 live species, more than 100 interactive experiences, changing and permanent exhibits, and seasonal events and festivals. We provide undergraduate and graduate students opportunity to gain practical experience with formal and informal teaching opportunities with visitors of all ages. ECHO’s Education Internship offers a challenging and highly rewarding experience for anyone considering a career in informal science education. This is a fast paced environment which requires both team and independent work, the ability to work with visitors of various backgrounds and ages, and a passion for our mission.